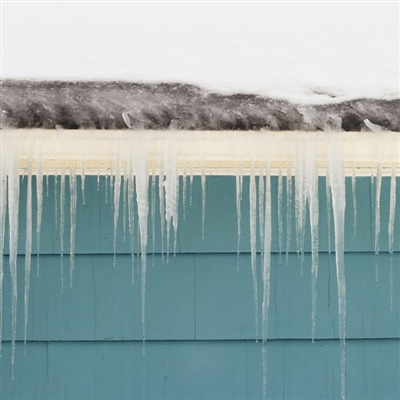 Proper attic insulation, attic ventilation and roofing installation are all keys to preventing ice dams. In our article “How do ice dams form”, we explained what causes ice to form at the eave edges. The key to preventing ice dams is obviously to stop warm air from getting into the attic space as well as getting the warm air that does enter the attic out quicker. This is accomplished by making sure that there is adequate insulation installed. One thing that is often overlooked is warm air from the living space entering the attic through ceiling lights and fans and also around plumbing pipes that run up through the house, into the attic and out the roof. These areas can let a significant amount of warm air into the attic if they are not properly sealed. The reason for this is that the interior of the house is actually at a higher pressure than the colder areas like the attic and so warm air (trying to get from high to low pressure) can shoot through small un-sealed areas. Often this is apparent by a visual inspection of the snow on the roof. A trained eye can detect areas where the snow surface has sagged down which can indicate a hot spot. And just below the hot spot at the eave edge there will be an icicle hanging or even an ice dam. Proper ventilation is important so that any warm air that does get into the attic has a way out, the quicker the better. Two things that go hand in hand with venting is getting the warm air out through the peak areas of the roof as well as letting cold air get into the attic to displace the air that is going out. This is very important because if no cold air can get into the attic then no warm air will be able to get out. This is simple physics. We will often find that the vents in the soffits (the area under the eave with holes or vents cut into it) have been plugged up with insulation that is either pushed into the soffit from the inside of the attic or that insulation blown into the attic has plugged up this area. Simple chutes installed between the roof rafters that extend from the soffit up into the attic 4 feet will prevent this.